Consumer sentiment in October falls just short of expectations. The University of Michigan's survey finds American confidence in U.S. economic policy is at a 15-year high. The survey considers 500 consumers' outlook on economic prospects. A survey of consumer sentiment in October fell just short of expectations on Friday but found American confidence in U.S. economic policy was at a 15-year high. The University of Michigan's monthly survey of consumers hit 99 in its preliminary reading for October, below the 100.4 expected from economists polled by Reuters. The index remained just below September's reading of 100.1. "Consumer sentiment slipped in early October, although it remained at quite favorable levels and just above the average reading during 2018," Richard Curtin, chief economist for the survey, said in a statement. Within the survey, a key data point revealed growing bipartisan support for the government's economic policies. 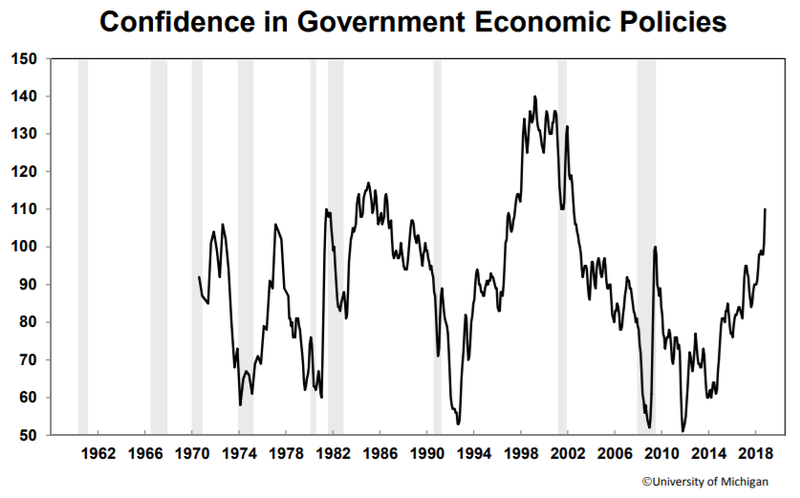 "Confidence in the government's economic policies rose in October to its highest level in the past fifteen years (see the chart), reflecting the strong performance of the national economy," Curtin said. "Most of the October gain was due to an upward adjustment by Democrats, although their evaluations were still well below the much more favorable evaluations of Republicans." The overall index has slumped since March when it reached its highest level since 2004 with a reading of 101.4.